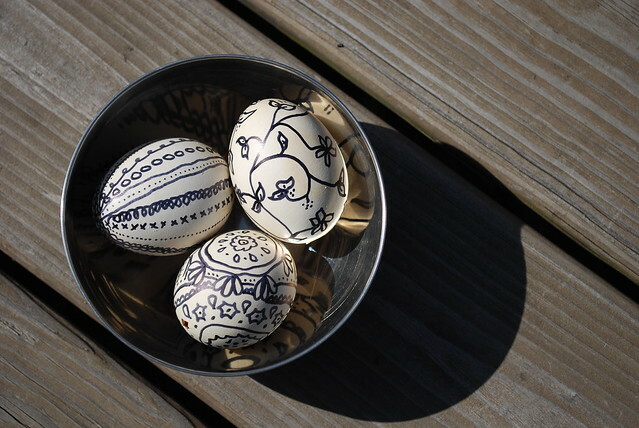 During a recent crafty getaway with Sarah, I doodled on some easter eggs. One a day in fact. They were like my creative break from being creative. Does that make sense? They were easy, had no plan, and no required outcome. If they turned out nice – hurray! If not, I wasn’t really out any time, frustration or money. But I’m happy with the final result and since we were traveling the week prior to Easter, they were our sole decorations for the holiday. These were inspired by some I found on pinterest that Alisa Burke had done. Hers are crisp white and black with finer details. Something came over me while I was packing for our trip and I thought of those eggs. So I tossed a few previously blown out eggshells into the oven to bake off any potentially harmful bacteria, stuck them in a container with a sharpie and into my suitcase they went. The question is, who did I think they were going to harm? It’s not like I was filling them with chocolate. I wanted to boil them but I didn’t have time for them to dry before leaving town, so baking had to do. I now think this was probably an unnecessary step. Unfortunately, it browned the shell a bit. Fortunately, the antiquey sheen given to them by the baking grew on me. More so when I placed them in a gun metal glazed Eva Zeisel relish dish. 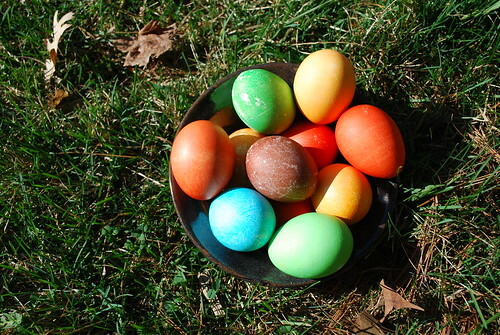 Although there was no crafting for the baskets this year, we did get around to dyeing eggs. A little more than two dozen in fact. 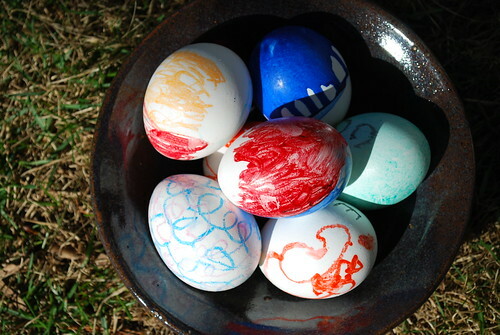 In previous years the kids interest in the dyeing process always waned quickly after the first few eggs. It finally dawned on me to do more than one technique to keep their interest. It would have been even smarter had I spread out the dyeing over the entire week, but truthfully I’m not THAT smart. So all egg decorating was done spread out throughout the day on Saturday. Everyone had a blast. I’ve listed the inspiration posts here. I say inspiration because I didn’t actually read any of the directions. That would take more concentration than I have on hand lately. Instead we winged it and everything turned out fine. None were perfect, but I rather like things that way. Here are our tissue dyed eggs. We painted on shreds of bleeding tissue paper with vinegar water. Above is the result after they dry and we peeled the tissue off. Inspiration from The Artful Parent. Once Eleanor got over the slightly messy nature of this project everyone had fun. They also enjoyed peeling off the paper to find out the mystery results. I like both the before and after. 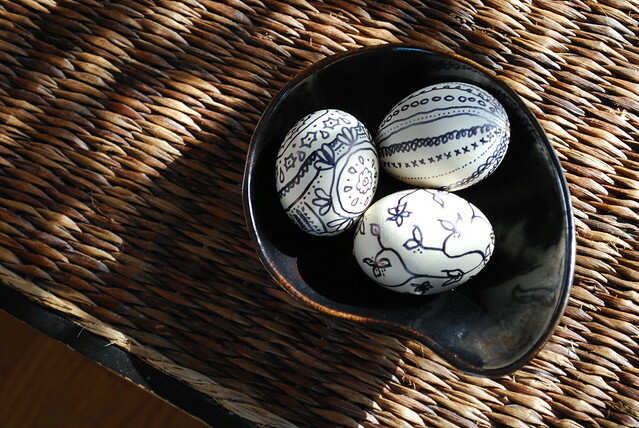 Here are some eggs we drew on with crayons while still hot. 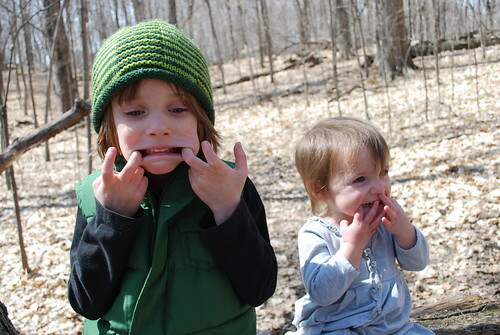 Inspiration from Family Fun via The Artful Parent. The kids loved this but only lasted through two a piece. Tiring work you know. 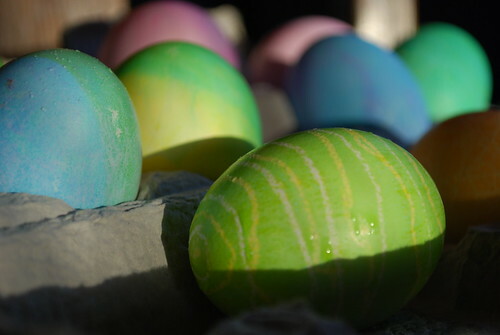 And lastly Kool-aid dyed eggs. Inspiration from Gingerbread Snowflakes via The Crafty Crow. 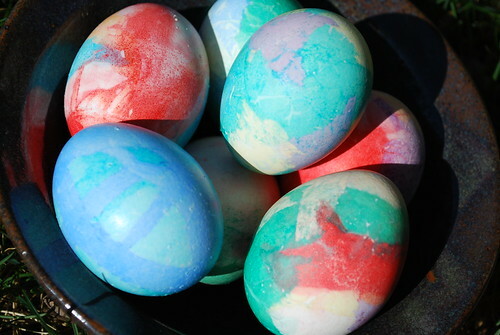 Maybe next time we’ll dye a few of the melted crayon eggs in kool-aid similar to the eggs Jean did this year. 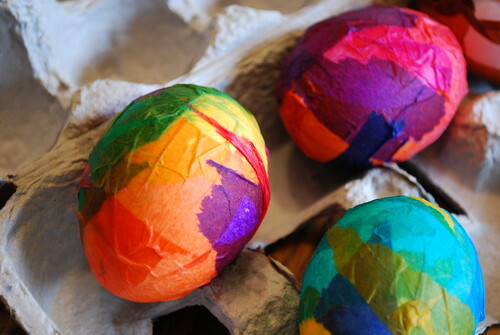 I’d also love to try dyeing eggs with silk ties like Kristin. Hers turned out soooooo beautiful. 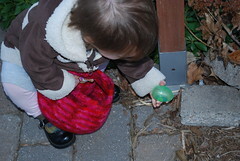 My biggest success of easter was converting the kids from the plastic egg hunt to a hunt with the eggs they dyed. It made me extraordinarily happy not to do the plastic thing. AND not to have to fill them with candy or the like. When explaining to the kids this turn of events, I did compromise with Seth’s suggestion of the easter bunny hiding one plastic egg per child with a little surprise inside. (a little chocolate and an old fuzzy little chick). They were satisfied and happy. Apparently all my stressing over how to convert them was for naught. The downside to the eggs? Our fridge went out on the big day. And since I wasn’t about to spend holiday charges to get it fixed and our neighbor’s fridge could only hold so much, all the eggs had to be tossed. Boo. But since we would have been hard pressed to eat that many eggs and we were able to have the fridge fixed on Monday, I think we’ll survive. I hope you all had a happy easter! Happy Easter everyone! We had a great weekend and I finally got around to culling through my pics to share with you. There was egg dyeing with a little crayon resist on Saturday. Eleanor was not at all patient with this process. She’d make one 1/2 inch crayon mark and announce “That’s eee ’nuff!”, insist on plopping the eggs in the dye herself and almost immediately yell “That’s eee ’nuff!” and want to remove them from the dye. Most of the eggs she did were extremely pale. All of Seth’s eggs ended up some variant of green. Once he found out you could dip in more than one color though, things started to get more interesting. Sunday morning started with the easter baskets I already told you about. 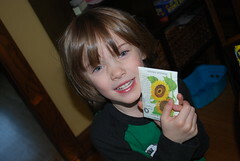 Here’s Seth’s showing off his favorite item received (a packet of sunflower seeds) and Eleanor with the finger puppet I made (inspired from here) on her head. 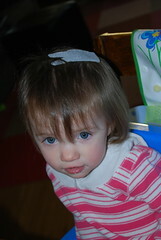 I do not know why she’s wearing it on her head. I turned around and there it was. She kept it there for a good 10 minutes. Maybe it was in protest because I made them a tad too small so they’re a bit hard to put on. 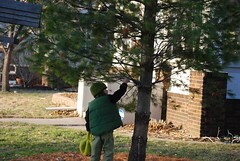 Then there was the egg hunt outdoors. I tried to get away from the plastic eggs, but I ran out of energy and it was the one thing Seth remembered from last year and was looking forward to. I ended up doing a combo of plastic eggs and the real eggs we had dyed. Seth was fast as lightning so hard to photograph and Eleanor spent a lot of time picking herself back up because she kept tripping when she saw an egg. She was that excited. 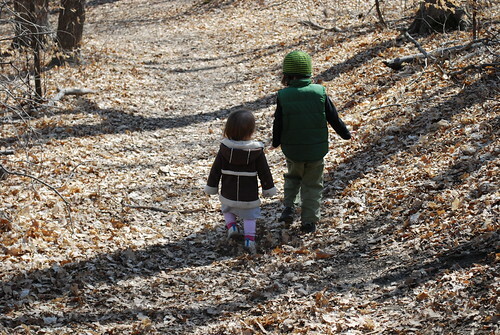 Finally we went for a hike to look for signs of spring. I’m hoping the hike becomes one of our easter traditions as it was probably my favorite part. 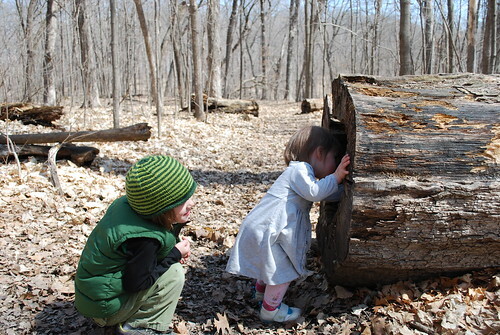 I had snuck a copy of The Best Hikes of the Twin Cities by Kate Havelin into Steve’s easter basket so we picked a hike out of there and set off. By the end of the day we were tired and happy. How was your Easter?